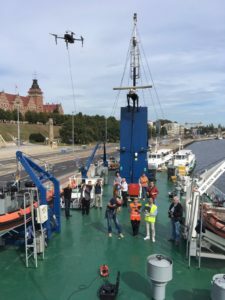 SARA is a semi-autonomous system composed by a tethered drone and its hangar, tightly coupled onboard the vessel through a strong kevlar cable used for power supply and data transmission. 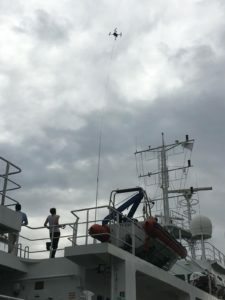 Its main advantage, comparing to other drones available on the market, is the capability to deploy in a very short time a Virtual Pylon up to 100 meters above the vessel for persistent flight operations in night and day conditions. 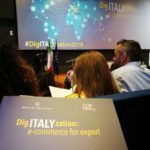 SARA solution is a clear response coming from institutional stakeholders needs, requesting a technological support in response to the increasing migratory flows, in the Mediterranean Sea. 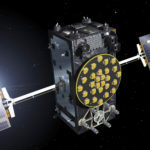 The solution enhances Search and Rescue (SAR) operations by means of a Visual and Thermal Infra Red payload (30x Optical zoom for day operations, 8x Thermal Digital zoom for night operations). which provides a significant added value during the vessel’s navigation. In fact, drone must follow the ship with the additional constraint of the cable. 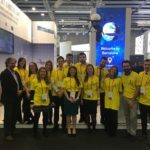 To face this challenge, both EGNSS receivers installed on drone and hangar provide feedback and an accurate continuous measurement of the baseline from Drone to Hangar. 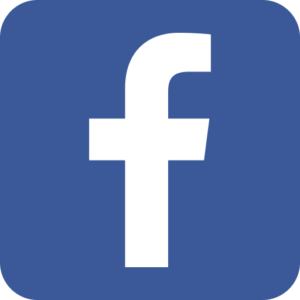 This valuable information, in combination with other environmental parameters (e.g. 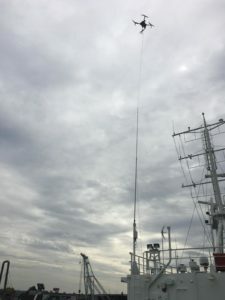 apparent wind, vessel’s speed, drone’s speed, …) is necessary to SARA system to tune in real time, the idle torque settings of the winch mechanism that deploys the cable. 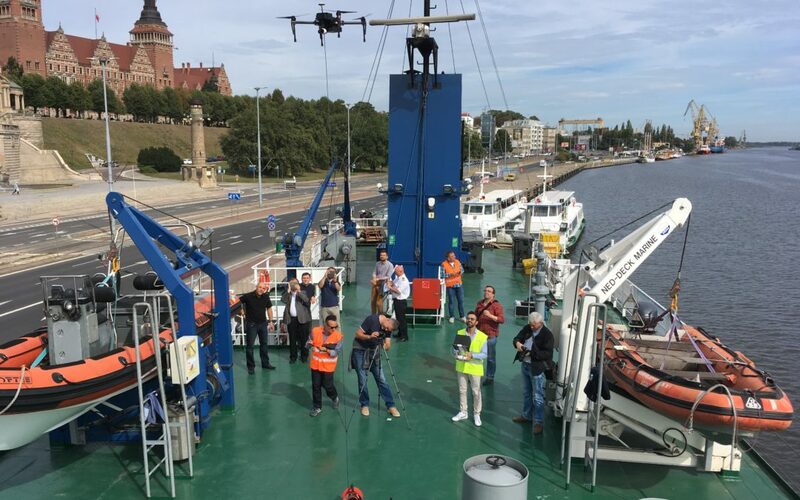 The first tests of the tethered drone took place on the research-training vessel of Maritime University of SzczecinNavigator XXI. The drone is supposed to be a tool primarily for SAR services, enabling the increase of detection range of survivors and their precise location. 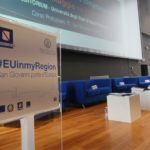 The focus of the project is to construct a specialized device, intended for work in marine environment, resistant to a wide range of meteorological conditions, salinity and dynamics of ship’s motion in waves, providing continuity of Search And Rescue (SAR) service before and after survivors’ detection. In fact, the drone can operate for several hours without landing. 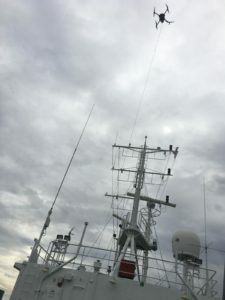 The advantage of cable consists either to avoid interference caused by many electromagnetic devices (in particular radio and radiolocation equipment) mounted on ships, thanks to its capability to transmit data from payload to the vessel’s bridge and to receive C&C (Command and Control). 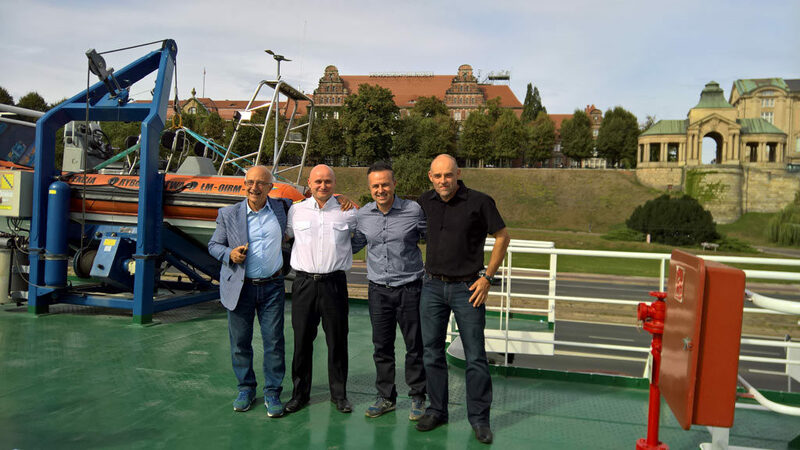 We would like to give a special thanks to Prof. Lucjan Gucma and Prof. Paweł Zalewski for their warm welcome and professionalism and to all the staff of Maritime University of Szczecin for their support and proficiency. 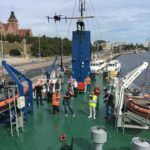 Wonderful experience during the preliminary tests of H2020 program “SARA” with our tethered drone solution on board the Nawigator XXI!!! Akademia Morska has the perfect blend between state-of-the-art technologies in maritime domain and “romanticism” of navigation. You can feel the passion for nautical sciences everywhere in the corridors, laboratories and especially when talking to Akademia’s gentle and professional personnel!